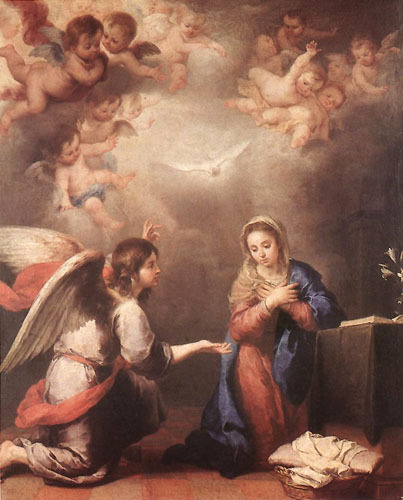 Van Ey&ccedizzz;k's Annunciation could possibly represent the Golden Mass which was popular at the time in the Netherlands, including a staging of the Annunciation as a Gospel reading. Nevertheless, it is unknown when van Eyck painted this piece but, like many of his works, Annunciation is a complex maze of iconography. The temple is composed of two styles; Romanesque in the top and Gothic below. The decoration of the temple is derived from the Old Testament but the figures are from the Middle Ages. This shows the transition from the Old Testament to the coming of Christ. Holy light in the forms of rays painted in gold come down from the window on the left hand side as well as the dove, the Holy Spirit. The seven rays signify the Seven Gifts of the Holy Spirit. Mary says, "Ave Gratia Plena" or "Hail, full of grace" and "Ecce Ancilla Domini" or "Behold the handmaid of the Lord", but writes it upside-down for God to see it. This upside-down writing can also be seen on the closed Ghent Altarpiece. Van Eyck painted a dilapidated ceiling with boards missing and others broken and probably intended this to highlight the transition from the Old Testament to the New. On the rear wall there is a stained glass window that depicts Christ standing on top of the world. The Map of the world is derived from the Middle Ages and represents the world divided between Europe, Asia and Africa. In the window the configuration of the world is reversed and Asia is placed on the bottom. This probably indicates when Christ came, how he gave man the chance to be saved and everything changed. In the stained glass window Christ standing below three glazed windows might suggest the Holy Trinity. On the side of the windows are paintings of Moses being found by Pharaoh's daughter and Moses receiving the Ten Commandments. Roundels of Isaac and Jacob are found below harking back to the Old Testament. Going back to early Byzantine art, the empty stool may be an empty throne, a symbol of Christ. It may have been in reference to Isaiah LXI, "Thus saith the Lord, the heaven is my throne, and the earth is my footstool. " The lilies - although a symbol for the purity of Mary - in Flemish painting were often used to represent Jesus. There are also seven open lilies which correspond to the seven beams of light or the Seven Gifts from the Holy Spirit. 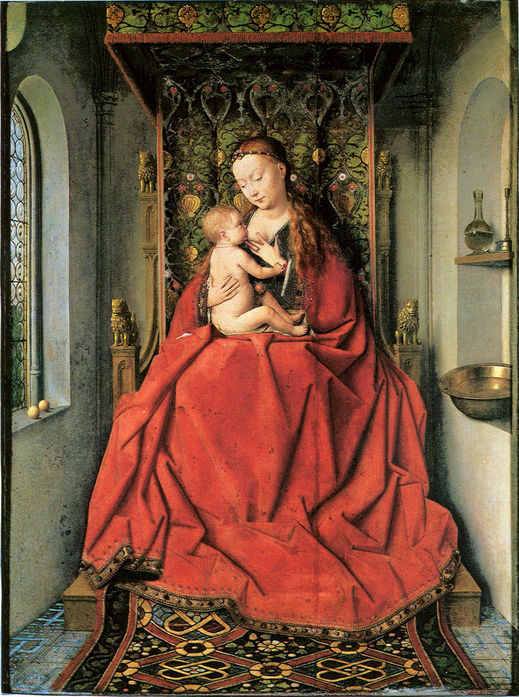 The image of Mary could have possibly come from the portrait, or portraits, van Eyck had painted for Philip the Good when investigating a marriage proposal in Portugal. Her hands are in the position of "expansis minibus" to show surprise at the news of Gabriel. Mary is wearing a blue dress with trim that is used for royalty but it is rather plain and has a striking contrast with the clothing of Gabriel. Interestingly, it is impossible to tell if Mary is standing or sitting. She is holding a book which is the right size for the Gospel. Gabriel's garments would indicate that he is a High Mass and support the agreement that this is a scene of the Golden Mass. 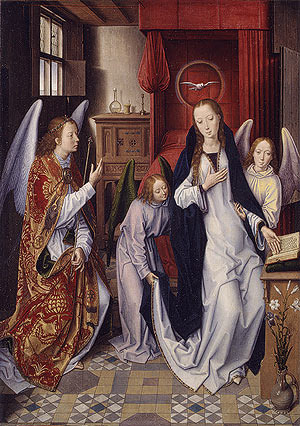 Annunciation is thought to have been commissioned by Philip the Good who van Eyck was employed under. In 1871 the work was thought to still be in the Duke's tomb. 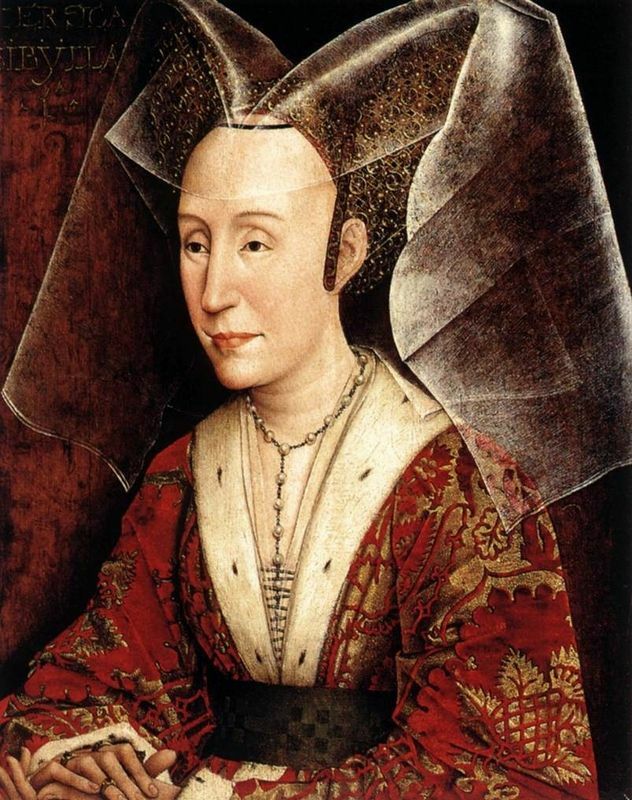 Some believe that in the painting Mary resembles Isabella of Portugal whom the Duke of Burgundy married and had sent van Eyck to Portugal to paint a portrait of. The Annunciation or the act of informing Mary that she was to give birth to the son of God, was popular at the time and seems to be a common theme in van Eyck's oeuvre. There is a similar scene with Gabriel the Archangel and Mary in the outer panels of the Ghent Altarpiece. 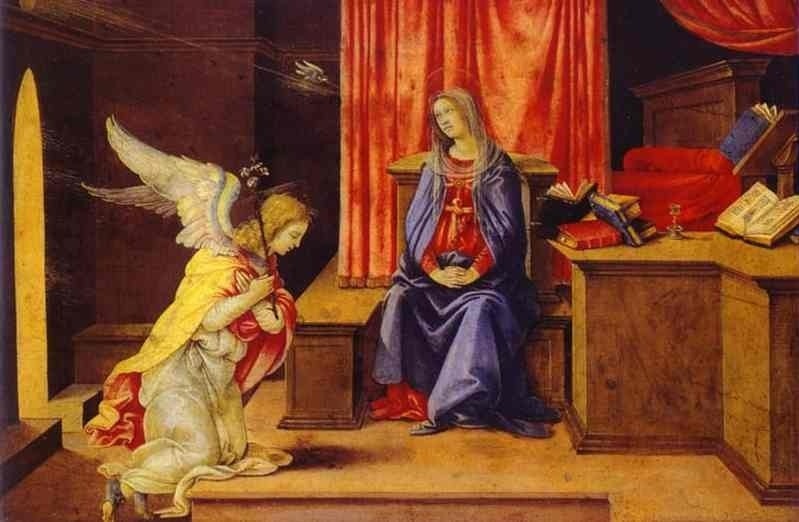 Also, although staging the Annunciation in a church, it has been argued that manuscript illuminators, such as Jan van Eyck, had a tradition of connecting Mary's body and the "body" of the church. Stylistically, Annunciation seems to come in between the Ghent Altarpiece and van Eyck's later works like Virgin in a Church, 1437. Annunciation is considered to the left wing of a triptych and was originally painted on wood panel but was later transferred to canvas. In the past, a painting was not only praised for its artistic achievement but also for how much precious materials it used, like gold. In Annunciation there is little gold and it is reserved for the rays of light streaming in from the left side of the painting. There are two directions of light; one coming from the window and hitting Mary on her right and the other coming in from the right hand side. The light highlights thematically the light of God. Van Eyck is a master of indirect light and his skill is seen here depicting Gabriel's extravagant costume. Consistency in Jan van Eyck's paintings, his innovations and development of the wet-in-wet technique in oil painting allowed the artist to develop perspective and a high level of detail and rich color. For his larger works van Eyck often chose to use large brush strokes, like his brother Herbert did, to create a smooth surface. Investigation with infrared reflectography has allowed deeper analysis of the painting, where the parallel hatching and clusters of longer strokes in the Virgin's robe become apparent. Eyck uses a 3/4 view of Gabriel and Mary's faces. This technique or viewpoint enables the viewer to read facial expressions and adds realism to the painting. The 3/4 view was primarily used by van Eyck in his portraits. The complexity of the floor tiles and the interior of the church suggests that van Eyck had a complex under-drawing with up to four vanishing-points, which reduces the depth and slows the rate of foreshadowing. From infrared scans it is clear that the artist changed his layout several times after beginning to paint. The small pilasters were originally planned to be painted again on the rear wall. The layering of paint on the rear wall is much thicker and therefore van Eyck may have started to paint the pilasters but changed his mind and painted over them. In the original drawing all of the planks were intact. No written critical reception about Annunciation exists from during van Eyck's lifetime. 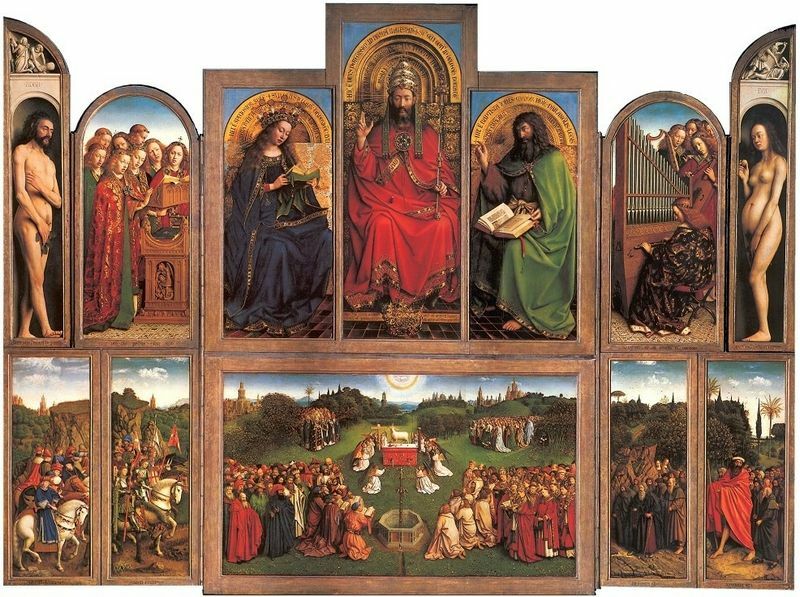 From the amount of travelling this work has undertaken, it can be seen to be a famous and monumental piece in the history of art, but like almost all of van Eyck's work most of the critical reception lies in deciphering the iconography. Erwin Panofsky writes; "Jan van Eyck had so thoroughly replenished his mind by dint of much portraying as Duruer would say, that he was able to design buildings, sculptures, paintings and ornaments in whichever style without resorting to individual models. Drawing from the secret treasure of his heart, he would endow with the semblance of utter verisimilitude what was in fact utterly imaginary... an imaginary reality controlled to the smallest detail by a preconceived symbolic program. " In 1791 a Carthusian monastery in Dijon, the Chartreuse de Champmol, is thought to have been the first place where Jan van Eyck's Anunciation was seen. William II, King of the Netherlands, bought the painting at an auction in Paris in 1817. In 1841 the work was moved to The Hague. Nine years later Czar Nicholas I of Russia bought the painting at an auction for the State Hermitage Museum in Saint Petersburg and it is here that the painting was probably transferred to canvas. 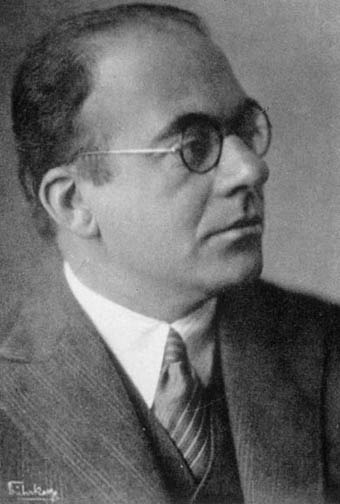 In 1921 a young German art dealer, Francis Matthieson, was asked by the Soviet Government to compile a list of the hundred paintings in Russian collections which should never be sold under any circumstances. However, they were sold soon after and ,ost were obtained from Russia by trading oil. Colnaghi's of London and Knoedler & Co of New York bought twenty-one of these paintings. 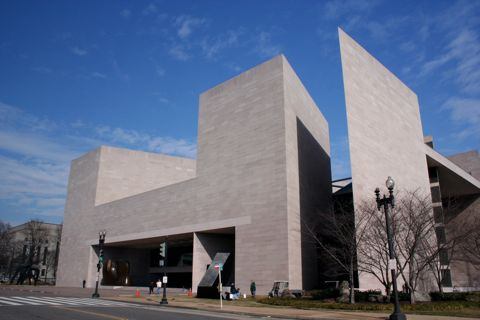 In 1931 Andrew Mellon bought the collection and deeded them to a trust which would later give all the paintings to the National Gallery of Art in Washington D. C. which was then still yet to be built. 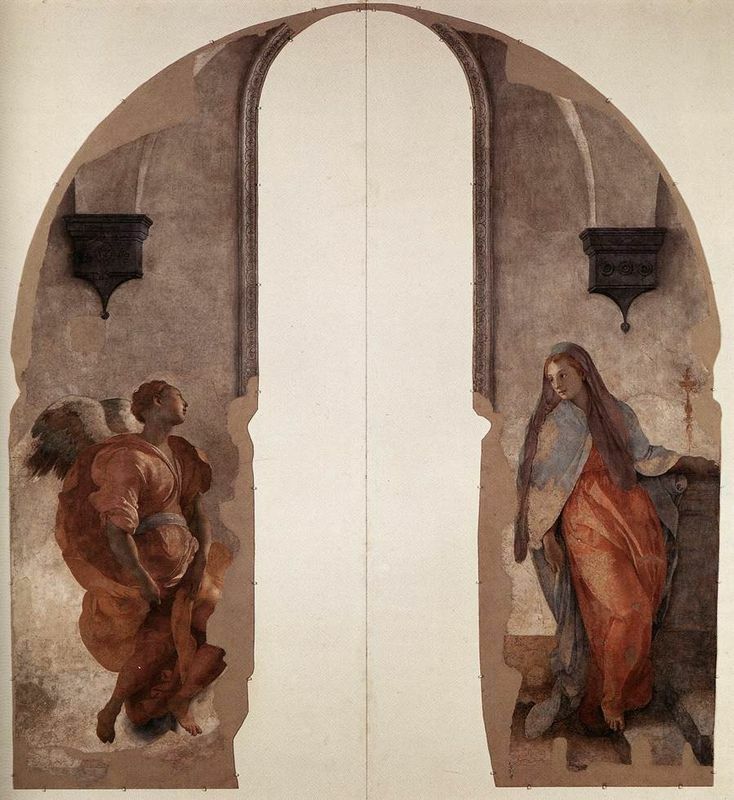 In 1937 Anunciation was relocated to the National Gallery of Art. Born in around 1390, Jan van Eyck has been known as one of the founding fathers of the Northern Renaissance. 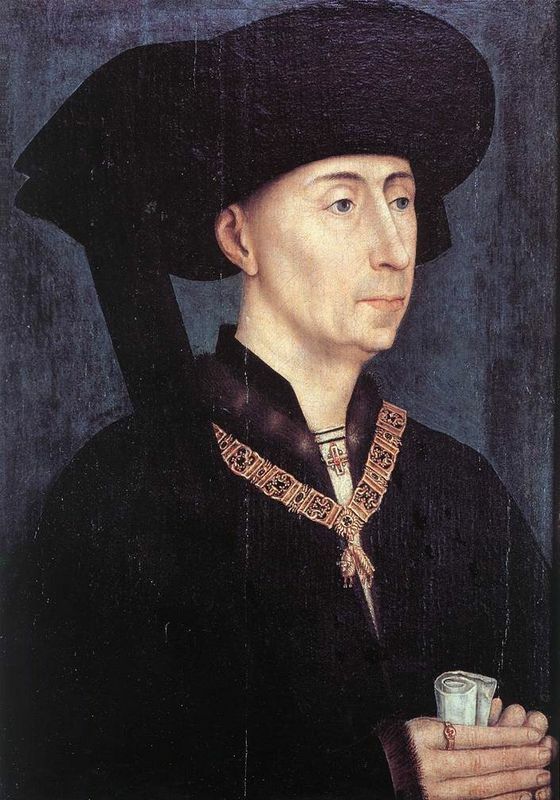 Working primarily for Philip the Good, Duke of Burgundy, van Eyck most likely traveled to Italy, Portugal and the holy lands to gain inspiration for his paintings. Probably through his experience as an illuminator, van Eyck furthered the use of oil paints through a unique adherence to detail and use of indirect light. His innovations with creating the 3/4 profile portrait view of the sitter became extremely popular with the growing merchant class and aristocracy and is still used today. After hundreds of years with no significant advancement in art the advent of the merchant class brought with it developments in commerce. 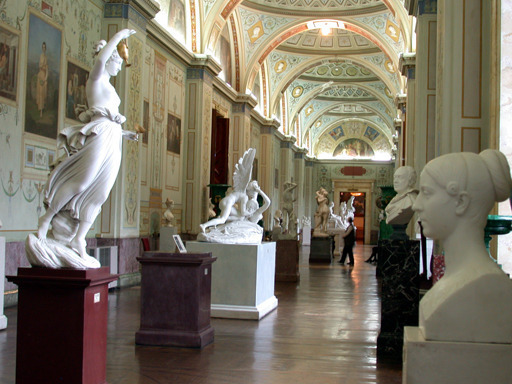 Europe, largely dominated by the Byzantine and International style at the onset of the 15th Century began exploring new ways to incorporate ideas from the past. 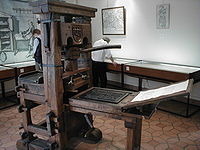 In Italy artists reverted back to classical ideas while in the north inventions such as the printing press would help education break social barriers. Such changes impacted society as a whole and there was a fundamental change in power as the merchant class gained wealth and status. Northern Europe is known for rejecting Rome and the Vatican's power and housed the Reformation.